Supplying only the best quality products. Real Time have been supplying hardware and all associated products for over 15 years to corporate, small business and SOHO/home user clients. We supply best of breed products, sourced to suit your requirements perfectly. All prices quoted include delivery and basic installation where necessary. Supplying only the best quality products from the most respected international brands. From our own Real Time branded desktop systems built for specific uses such as gaming through to high end branded units for corporate executives, we supply it all. A typical installation will include setting up your network connections and printers. Assistance with transferring your existing data to your new system is offered but billed separately. 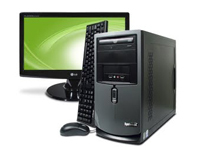 We supply most popular brands including Lenovo, HP, Dell, Acer and our own Real Time custom units. 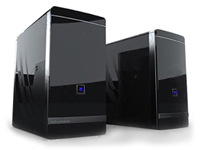 We supply a wide range of servers from all manufacturers, each customised for its intended duty. From small fan-less communications servers for maximum uptime over a variety of networks to huge enterprise servers utilising the latest VM trends. We are comfortable in both Microsoft and Linux environments and will recommend the best solution to suit your needs. Server brands we regularly supply include, Dell, Hewlett Packard, IBM and Intel. Some machines just a few years old may seem to have passed their useful lifespan but often the addition of memory and a faster drive can extend that lifespan for another year or two. Sometimes older components are very expensive so it is a balance whether to reinvest in old hardware or replace. We are more than able and happy to assist you with these decisions.